Could A New Series Fill the Void of the Canceled Night on Broadway? Night on Broadway Is off for 2019. Could This Monthly Series Fill the Void? 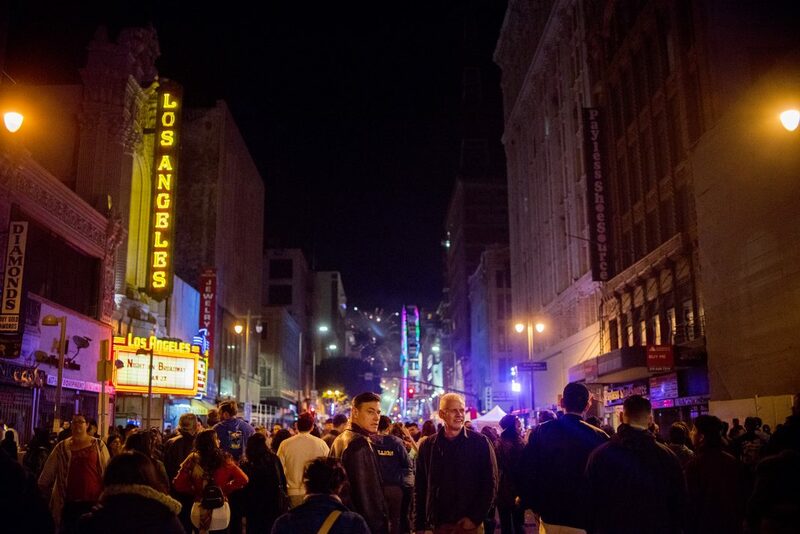 Earlier this year, Night on Broadway brought 250,000 Angelenos out for an evening of free entertainment in and around the Broadway theater district of downtown L.A. But, amid a City Hall scandal, the 2019 event was called off just weeks before it was scheduled to take place, raising questions about its future. City officials say they plan to revive the canceled Night on Broadway in 2020, but at least one man is working to mount an alternative. Bringing Back Broadway was a ten-year strategic economic development plan that launched in 2008. Among the projects in that plan were programs offering grants and incentives to restore historic facades, signs, and lighting along the stretch; business assistance to “reactivate” vacant buildings; and the Broadway Streetscape Plan to make the area safer for pedestrians. Supporters of the initiative take credit for helping spur nearly $1 billion in new, private investment in the neighborhood. Night on Broadway was perhaps Bringing Back Broadway’s most visible project. The key champion of all this was L.A. City Councilman José Huizar. When Night on Broadway started in 2015, his name appeared on every poster and event announcement and glowed on marquees of many of the participating theaters on the night of the event. Then, on December 4, the event, officially billed as “Councilmember Huizar’s Night on Broadway,” and scheduled for January, was abruptly canceled. The announcement came quickly on the heels of the public disclosure that Huizar was involved in a federal corruption investigation and a lawsuit by a former staffer alleging misconduct. After some initial concerns over what might happen to the event given Huizar’s situation, City Hall sources have confirmed that the event will return in 2020 (albeit perhaps without the councilman’s name attached). But that may not be soon enough for some downtown entertainment enthusiasts, including Marcus Lovingood. Lovingood has launched a crowdfunding campaign to produce a performance series inspired by the original. On his GoFundMe page–which Lovingood titled “Save a Night on Broadway”–he lays out his vision for a monthly series he hopes to bring about, A Night on Broadway West. Rather than a single night, when Broadway turns into a block-party atmosphere with simultaneous events in multiple venues and pedestrian areas, Lovingood’s vision is to book just one performance each month for all of 2019. He’s not ready to reveal specifics of what he’ll stage should he meet his rather ambitious $50,000 fundraising goal, but emphasizes his background in live theater, and says that will inform the programming. The six-block stretch that comprises the Broadway Theater District contains 12 historic theater buildings, most of them built for vaudeville shows or at the height of the craze for “movie palaces.” Of that dozen, four have been converted to retail space or are shuttered. The remaining eight all continue to host events and performances with varying degrees of frequency. Even the busiest of them, the former United Artists Theater now known as the Theatre at Ace Hotel, has occasional dark nights. And that’s where Lovingood hopes to step in. The $50,000 he’s seeking from the GoFundMe campaign would be used to book the initial performances and set aside 500 free seats at each show to be distributed to the community. The remaining seats would be ticketed at $20 each. Lovingood’s ambitions go beyond just the monthly Night on Broadway West proposal. He’s also formed what he calls the Broadway West Initiative, which will be involved in lobbying on behalf of polices deemed to promote a vibrant downtown theater district, and also offering grants to “Broadway-caliber theatrical productions,” referring to New York’s Broadway theater industry. The initiative would also incorporate an in-house theater production company to stage shows. While specific to live theater, the general intention of Lovingood’s organization is in keeping with the Bringing Back Broadway mission, which inspired the original Night on Broadway. Without access to the resources that Huizar’s office was able to corral, however, pulling it off may be a stretch. After 15 days, the “Save a Night on Broadway” GoFundMe had raised only $425. Nonetheless, Huizar’s office and the Night on Broadway organizers are supportive of the Broadway West efforts.